Sugar is a weakness of mine. While to you that might be a rather obvious statement, what with me being the creator of Sugar High Fridays, I don’t think I fully realized the whole truth until recently. You see, it was a closeted fetish all these years. One I harbored yet denied frequently, guiltily, shamefacedly…but vehemently. I remember in university I practically lived off sugar. Sure I could cook and was actually working my way through a book of soups and soup stocks while I was in school, but sugary snacks were my vice. I guess that might explain the unending amounts of energy I had then…that and being nineteen years old, I suppose.I recall one afternoon while memorizing a script for a show I somehow managed to eat my way through an entire box of store-bought strawberry flaky pastries. I also recall having a bad head cold one day and eating three chocolate bars in place of three healthy meals — which somehow cured me. I remember baking an ooey-gooey chocolate pudding cake for a friend’s birthday party and wanting desperately to just stay home with said cake and keep it all to myself. It was a sickness, really. Lately I’ve been much better. I eat fairly well on a day-to-day basis and I no longer self-medicate with chocolate or ice cream, at least not regularly. But the attachment is still there. I figured this out after I’d eaten half a batch of homemade fudge while I watched a movie about a week ago. I could feel my heart palpitating as I sat there after wards, glowing in the after-effects of entirely too much sugar. 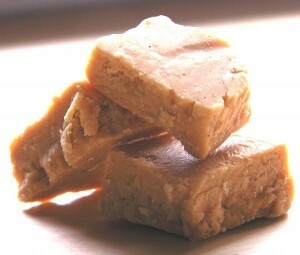 While I haven’t touched a piece of this fudge since that fateful day last week it does call to me from the cupboard in the kitchen. I can smell it as I sit on the sofa; it’s sweet, buttery, sugary scent wafting its way towards me. I think I might just have to have one more piece. Just a very small one this time.